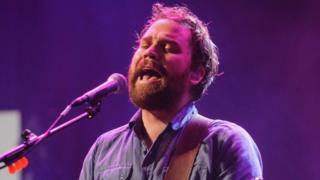 Friends from within the Scottish music scene have spoken of the "pure joy" Scott Hutchison brought to their lives - and the impact his music had on his fans. The Frightened Rabbit singer's body was found on Thursday night near South Queensferry, almost two days after he was reported missing. Scott - who had talked openly about his mental health and depression - had written a tweet late on Tuesday saying "I'm away now." His friends say his legacy will live on in his music, which helped so many deal with their own struggles. Roddy Woomble, the lead singer of Idlewild, told BBC Scotland that he struck up a friendship with Scott because of a mutual admiration for each others' work. Roddy said that when they first met, Scott had told him how he'd grown up listening to Idlewild. But Roddy was blown away when he started listening to Frightened Rabbit. He said: "Frightened Rabbit's music is beautiful. Scott was an extremely talented songwriter because he could make a connection with his audience. It's not something everybody can do. "When you write lyrics that make sense, are honest and from your heart then other people can understand them. "Songs can have such a big impact, especially if they hit you at the right time in life. "Frightened Rabbit have been around for 15 years now, so they will have been the soundtrack to some people's lives. A generation grew up listening to them. "If you were 15 when you got into them, you are 30 now, and that's an important and influential portion of your life. "You remember that kind of music for the rest of your life. "His music meant so much to people and it's sad that he felt that alone when he was surrounded by so many people who loved him." Scott had spoken openly about his mental health and his battle with depression. He talked about it in song lyrics, and sometimes in interviews. In an interview last year, he said: "Sometimes I wish I had a better mode of communication for when I'm feeling depressed, anxious, any of those things, but it tends to just work itself out into a song. "That's the way it's always been for me." Roddy said he had never seen a "darkness" in Scott. "You could see in his eyes there was something going on, and obviously through his music and lyrics you could hear it," he said. "But my experience of him was one of pure joy - he was a joy to spend time with. "Once we got to know each other we hung around socially. One of the last times I saw him was at the International Book Festival in Edinburgh last year. Afterwards we went out to Optimo." Roddy said he knew Scott as "a gregarious guy". He added: "He seemed to love that socialising, the being with people. "It's terribly sad and I am devastated. I just don't want to believe it. "I knew that Scott struggled with mental health issues and depression but I just didn't think it would come to this." Radio Scotland DJ Vic Galloway became friends with Scott after he started playing Frightened Rabbit on his show. He said: "I considered Scott a friend, not just somebody I play on the radio. "I have been playing Scott on the radio for more than a decade, probably since about 2006. I champion new music and am always on the hunt for something interesting. "Then along came Frightened Rabbit. "I started playing their stuff and featuring them live in session and as a result I got to know him. "He was a down to earth, funny, straight forward sort of guy which is why I can't really get my head around all of this. "He was an emotional guy - you can tell by the lyrics of all of his songs, right from the beginning all the way to the Mastersystem album." He added: "He wore his heart on his sleeve and I could tell when I was hanging out with him that he considered what he was saying all the time. "Scott was an intelligent man, he checked himself the whole time. "I tended to see him when he was out and about at gigs or parties, and he was on good form. "He was a tender guy, but I never thought it would go to this extreme. "He was always cheerful when I saw him. He might have been cynical about life but he was always laughing at it. "This is obviously internal angst and the battle he was going through has manifested itself in his actions. "It was a side that I didn't see personally very often." Vic added: "His songs dealt with heartache, mental health, and the day to day trouble and strife that people go through. That's why it connected with people. "He sang from his heart, he sang from the bottom of his lungs, he really gave it everything he could on stage and on record. "Scott's passing will be mourned in Scotland and across the world. "The poignant descriptions of the state of his own heart and his own vulnerabilities. "Those songs will resonate with people for years to come." Isabella Goldie, director of development at the Mental Health Foundation Scotland, met Scott when he helped campaign with the charity. During that time he ran music events, produced a CD and worked with a small music mentoring charity to help people suffering mental health issues to promote their music. She said he was a generous and kind person, and "nothing was too much to ask of him". Isabella added: "When I first worked with Scott about 10 years ago, he was really happy and optimistic. "But over the years it started to become obvious that his moods had become a major issue for him. "We were all concerned and did reach out to Scott but it's really difficult for men to speak out and accept that help. "We have somehow created a society in which it is really difficult for men to come forward and say how they feel. "Obviously he had his own demons and struggles and it is beyond sad that he couldn't manage those." If you or someone you know has been affected by mental health problems, these organisations may be able to help.